The main objective of the WC-WAVE project was to provide the computational and visualization tools necessary to understand the hydrological impact of changing climate on snow-dominated watershed in the western U.S.
A Western Consortium consisting of Idaho, Nevada and New Mexico successfully completed a Watershed Analysis, Visualization and Exploration project resulting in a physically-based, virtual watershed platform. This work assembled a collaborative team of faculty and students with computational expertise and watershed processes and modeling expertise. The WC-WAVE project provided enhanced research capacity to 80 total participants from 13 different institutions across the 3 states. Both undergraduates and graduate students had the opportunity to learn about watershed processes, modeling, data management and visualization within a VWP. «« Stream flow measurement training at Valles Caldera, New Mexico. Physical watersheds in all three states were used as the basis for the VWP development.Data were ingested into the data management system and converted into formats required for both project modeling efforts and VWP development. Watershed scientists collaborated with software experts to develop adapters for the model runs and a suite of appropriate visualization tools.The long-term goal of the VWP is to expand beyond the models used in this project to any model and environmental parameter of interest to scientists seeking to visualize their data and modeling results.The resulting VWP allows watershed scientists to not only access and model data, it also provides a means to visualize data and model results in both a temporal and spatial framework. The WC-WAVE project produced 61 journal articles or conference proceedings and 52 professional presentations. Ten undergraduate and 23 graduate students who were engaged in the project successfully completed their degrees. 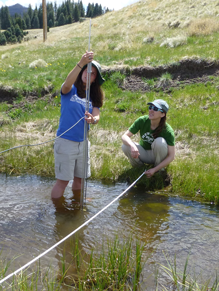 Researchers have already deployed another instance of the VWP in ID, hired a couple post-doctoral scholars and recruited new graduate students to continue VWP cyber improvements, explore new watershed model efforts within the VWP, and use the VWP within the classroom to train new computer- and watershed-science students. One of the significant training efforts of this project was the Undergraduate Visualization and Modeling Network (UVMN), which provided an opportunity for faculty and graduate students to mentor undergraduates from Primarily Undergraduate Institutions (PUIs), such as Mesalands Community College and Southwestern Indian Polytechnic Institute. 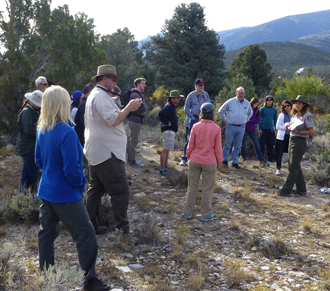 The UVMN training effort involved 26 PUI students and 24 PUI faculty. 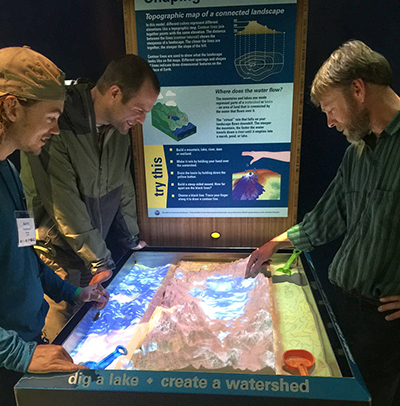 Key results from this program included the development of a virtual watershed sandbox to demonstrate the effect of topography on surface water flow and training in the use of geographic information systems to overlay and assess various environmental factors. The UVMN team estimates that the training they have received and in turn have disseminated to other PUIs and people from the general public has now reached at least 5,000 individuals.